This article appears in Aerospace & Defense Technology Magazine. Over the course of testing, the largest deflections occurred at the wing tips and the largest bending strains occur a few feet outboard the wing root. Historically, obtaining this level of insight into the overall strain distribution was only possible computationally through finite element models (FEM). Using FOS, finite element-like data is acquired experimentally on the actual structure. This allows critical areas to be confidently identified instead of just predicted, as well as serving as thorough FEM validation. 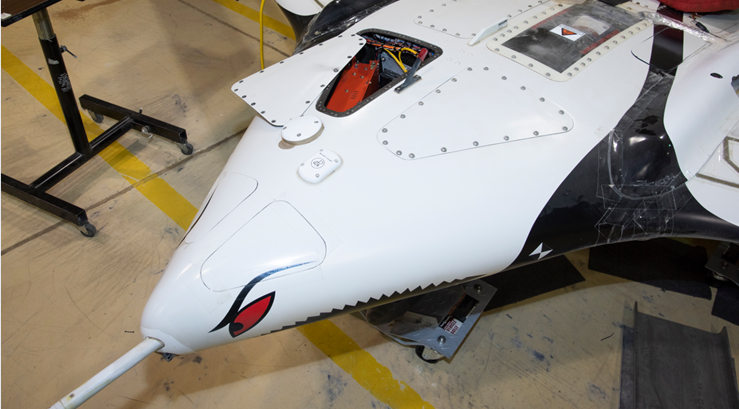 A repackaged version of Sensuron LLC’s RTS125+ real-time FOS interrogator flew onboard the X-56A to acquire the strain and deflection data. Considering the specific operating environment, the RTS125+ system’s size and weight was modified – while still offering a level of ruggedization – to ensure optimal performance throughout the mission. Sensuron’s RTS125+ acquires continuous strain and temperature distributions on up to 320 feet of small, virtually weightless, and long-lasting fiber optic cable. Optimized for flight applications at AFRC, this technology provides test and instrumentation engineers a new level of insight into the strain distributions, fatigue life, and in-operation performance of aerospace structures. In addition to real-time, in-flight structural health monitoring, there are a multitude of applications within the aerospace industry where FOS technology is being utilized, including the subcomponent level through full-scale structural testing, crack detection, composites embedment and cure monitoring, finite element validation, flight loads monitoring, and many more. For applications that necessitate the use of hundreds or even thousands of electric strain gauges, a significant reduction in installation time, weight, and complexity is realized by switching to distributed FOS technology. For smaller scale applications, significantly more sensors can be installed in the same amount of time that it takes to install only a few traditional strain gauges. Regardless of the application, fiber optic sensing technology enables engineers to capture significantly more data than they can practically with traditional sensors.